I was at LAX, ready to leave for Copenhagen. It was a hot day, they didn’t turn the air on in the plane during boarding. I had plenty of sock yarn available for the flight, books ready for prolonged listening on my ipod, and my sock monkey, who attends all knitting-related trips as this one. Here is the obligatory monkey pic. 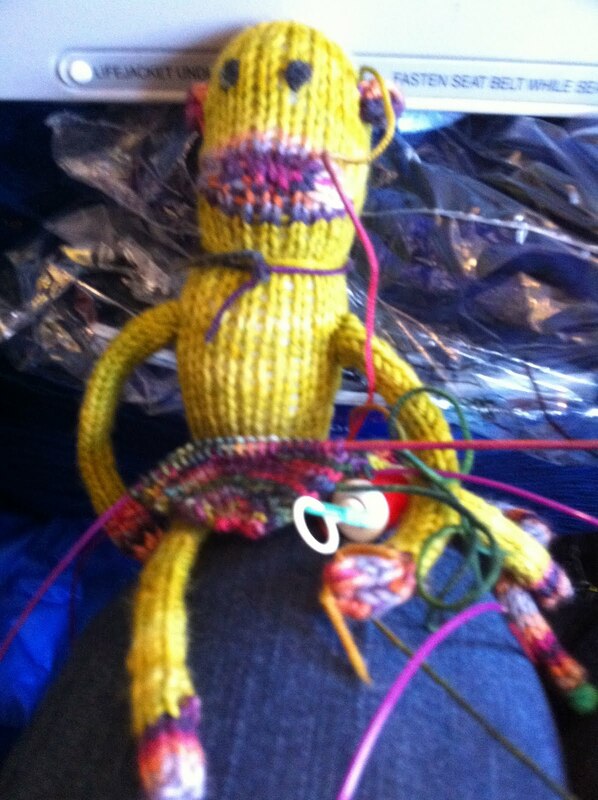 He is holding the toe of the travel sock I started after boarding. Toe-up Personal Footprints for Insouciant Knitters in STR lightweight, a Rare Gem colorway. I had a contest on this blog to determine which of 3 colorways I should knit. The Rare Gem came in first, Plankton Ooze second, and Pond Scum was 3rd. Remember this? Monkey made friends on the trip. So did I. Revisit this sight as I recall the cruise. It was awesome. My plan is to follow it along, day by day. Photos too. Please comment! I would love to hear from you! Even if you weren’t on the Baltic Cruise!